It's a lovely long one this week. Enjoy! Get waterside for the Canalway Cavalcade festival at Little Venice and on the Paddington Towpath from Saturday through to Monday, full programme here (free). It's the Camden Crawl music festival with its comedy and spoken word sibling and the free Crawlternative Media Expo on Friday and Saturday. The Crouch End Festival begins on Friday and stays creative right through to 13 May with exhibitions, a craft trail, music, dance, comedy, stories, poets and more, all over N8. Dalston's Land of Kings music and art fest fills all the area's trendy nooks and crannies this Friday and Saturday night. The London Archive Film Festival is at London Transport Museum showing international archive-based documentary and short film, with lots of Q&A sessions from 3-5 May (tickets £10). Hip hop dance takes over Sadler's Wells for the huge Breakin' Convention weekend, Thursday - Monday. Watch the annual International Horseball Cup at Lee Valley Riding Centre on Sunday and Monday (free0. Drinkers note there's the 'Smack the Oyster' Real Ale Festival at the Alma, Newington Green Road, N1 right through to Bank Holiday Monday closing time. The New Cross and Deptford Free Film Festivals are screening Coming to America on Friday and Attack the Block on Saturday and more before it closes on Sunday night (free). The London International Ska Festival runs Thursday to Sunday in Islington (tickets from £10, 4 day pass £122). The Foodies Festival sets up outside Hampton Court Palace with demonstrations, tasting sessions, masterclasses and scran shopping from from 10am-7pm Sat & Sun, and till 6pm on Monday (tickets £15/u16s free). Craft Jam offers two days of making and doing things in Kingly Court, off Carnaby Street on Friday and Saturday between 11am-7pm, courtesy of Things British. Home improvers will flock to ExCel from Saturday for Grand Designs Live (tickets from £12). Geek out at the Apollo Piccadilly with the last weekend of the Sci-Fi Film Festival. Make do, mend, swap and soup-up your clothes at the M&S Fashion Lab at the Old Truman Brewery, Brick Lane, in partnership with Oxfam and London College of Fashion until 9 May (free). The Chorus Festival at the Southbank Centre offers free singing events across the entire weekend. See where football matches are taking place in London this weekend, thanks to the London Football Guide. Take top tips on quality Bank holiday weekend clubbing. The Other Cinema present La Haine at the Troxy, Limehouse featuring a live score from Asian Dub foundation + other special guests from 7pm (tickets from £18.90). Book a table for the special Gin & Tonic night at the London Gin Club at The Star at Night in Soho. It's Free Comic Book Day across the world with Forbidden Planet on Shaftesbury Avenue and Gosh! Comics Soho taking part locally. Shoreditch Streetfest live art street festival takes over the Hearn Street car park from 1pm till late (tickets £15). Singalonga Oliver! at the Royal Festival Hall on the Southbank from 7pm (tickets £15). Run Riot suggests you play the Apocalypse Game Show from 8pm at a hush hush location (£5). Celebrate Cinco de Mayo at one of these fine London establishments. Have a pootle round the Eco-Chic Outdoor Market at Spitalfields City Farm from 10am-6pm (free entry). Witness the crowning of the new Pearly Kings and Queens at the pearly church, St Martin's in the Fields, followed by a cockney knees up at the Carpenter's Arms, Stepney E1 from 2-7pm. The London Gay Men's Chorus (featuring two Londonist contributors) mark their 21st anniversary with the Band of Brothers concert at the Royal Festival Hall at 7.30pm (tickets from £20). 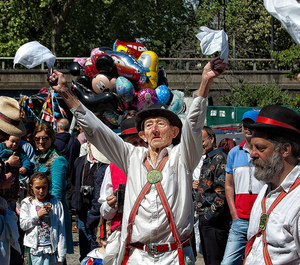 Celebrate May Day at Museum of London Docklands with family friendly folk dancing, Jack in the Green making and stories culminating in a May Day procession at 3pm (free). The Southgate May Fair takes place outside Christ Church, Southgate from noon - 4pm with seasonal stuff, stalls and fun for the kids. What did we miss? Let us know in the comments. Photo by daveograve@ via the Londonist Flickrpool. Think you know London? Treasure Trails are THE fun way to explore, with over 25 fun puzzle routes now available, from Harrow to Canary Wharf. Follow the clues on paper or try our new smartphone apps. Warning, they’re addictive!